Seniors require exercise just as much as anyone else, but some activities can be tough on aging bodies. That’s where Tai Chi comes to the rescue. Tai Chi is an effective workout anyone can enjoy by mastering a few simple basics. The literal translation of Tai Chi is supreme ultimate boxing. There are several theories about how Tai Chi got started, but it certainly has its origins in martial arts and it came from China. It’s a low impact workout that you can do alone or in groups with no special equipment. And you can do it anywhere! There are several major styles of Tai Chi that all stress balance and harmony. Yang and Sun are good choices for beginners and they will give you a lot of room to learn and grow. Develop correct posture. Tai Chi teaches proper alignment so you’ll instantly look better and have better posture. It also relieves backaches and helps you to better digest your food. Enjoy a whole body workout. Engaging your whole body burns more calories and massages your vital organs. Build strength and flexibility and slow down bone loss. Enhance your coordination. All that swaying and shifting your weight will give you a greater sense of balance. Your daily activities will become easier and you’ll reduce your risk for accidental falls and injuries. Brighten your mood. The dance-like steps in Tai Chi are a proven antidote for stress. Let your mind slow down and relax. Concentrating on coordinating your feet and hands will help you let go of your worries and live in the present moment. Talk with your doctor. Many studies show that Tai Chi can help manage conditions like arthritis, high blood pressure, and chronic pain. Ask your physician if it’s right for you. Get into position. Lift your head and tuck your pelvis. Draw your shoulders down and back. As your chest opens, you automatically start breathing deeper. Work both sides. Repeat all movements on the left and right side of your body. Most beginners will discover that they have a dominant side, but you can enhance your symmetry with practice. Breathe from your abdomen. Inhale from your lower abdomen, drawing air upwards through your middle abdomen and chest. Exhale in reverse. Match your breath to your movement, but avoid holding your breath. Warm up and cool down. Warm ups will put you in a more receptive frame of mind. Cool downs relieve any discomfort that may build up in your muscles or joints. Boost your energy. Traditional beliefs about Tai Chi credit it for getting your Qi, or life energy, flowing. Try massaging the pressure point in your palms after your warm up and before your regular session. Practice standing meditation. 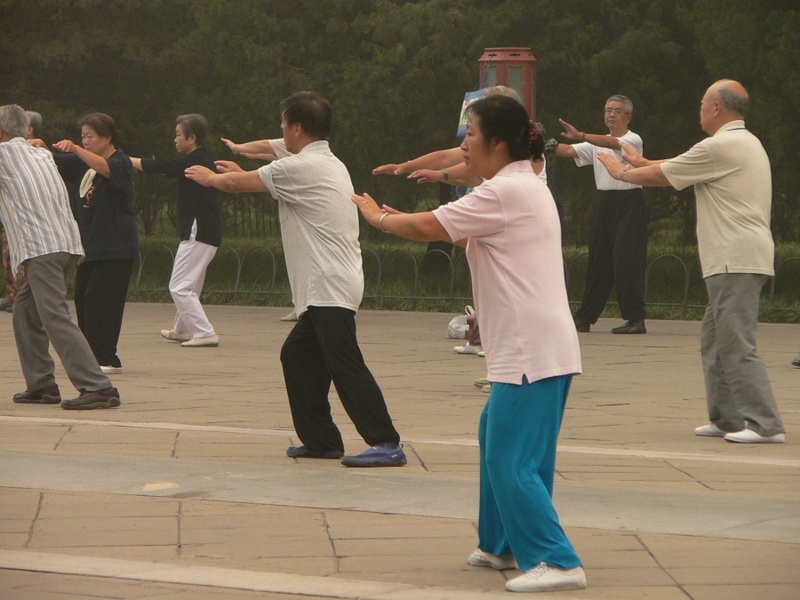 Some Tai Chi routines include a meditation that you can perform while standing up. Mastering Tai Chi will give you a meditation technique you can use anytime during the day to generate peace and contentment. Find an instructor. Tai Chi looks simple, but good form is required to reap all the benefits. Thanks to its growing popularity, you can now find qualified instructors all around the country. There are even programs designed especially for seniors where you can make new friends and progress at your own pace. Study independently It’s easy to get started with Tai Chi and there are many opportunities to go deeper. Visit your local library or ask your instructor to recommend books and DVDs on Tai Chi. Explore the underlying philosophy of it and other forms such as Chen and Wu. Tai Chi is great for both your mental and physical well-being. These powerful exercises can help seniors stay in shape with little risk of injury.